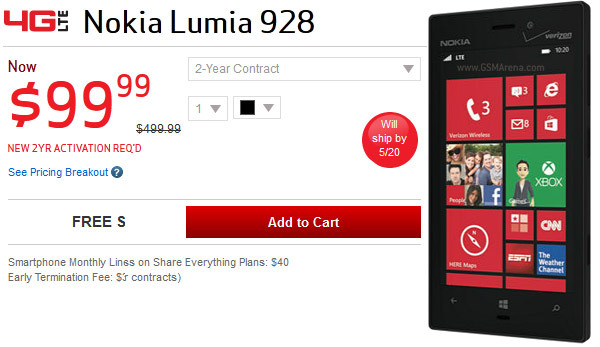 Verizon's WP8 flagship, the Nokia Lumia 928, is available for pre-order right now. It's priced $99 with a new 2-year contract or $499 with month to month service. The black one will ship by May 20, but when you select the white model, the "Will ship by..." label disappears. Note that the $99 price is after a $50 online discount. For a limited time you'll also get $25 credit for the Windows Phone Store. Both Black and White versions of the Lumia 928 are also available on Amazon, but there's no shipping date and they cost more - $199 with contract and $549 without. Still, if you're not in a hurry, Amazon usually offers better deals than the carriers some time after a phone's launch. Wp8 is the most unreliable OS as of now.